To prepare for your derby, decide on a date, place, and time, and make a reservation with us. Decide who will participate. Some groups also invite the 8 to 11-yr old girls to race with the Cub Scouts. We can usually accomodate most requests like these at no additional charge. Pinewood derbies are also fun events for older youth and adults. Provide a pinewood derby car kit for each participant, or ensure participants know where to get one. Siblings are welcome to also build a car and race it during practice time, but we recommend allowing only official participants to race in the main event. Instruct participants to make sure to design their cars to the correct specifications. It is very important to leave enough clearance underneath the car. 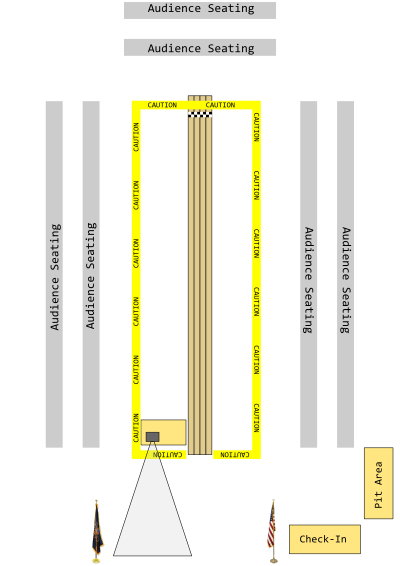 You can find the required clearances and other tips on how to build a pinewood derby car on the Information for Participants page. Recommended minimum clearances for pinewood derby cars. Packs differ as to the chosen rule set and level of enforcement. The most important specifications are for the cars to not be overweight, and to maintain adequate clearance under the car. Regardless of which rule set you enforce (or none at all), we do not allow liquid lubricants since these can damage the track surface. We also do not allow anything which may put the track or bystanders at risk. We will not strictly enforce other rules or specifications for the cars unless you instruct us to. If you have more than about 20 cars, we strongly recommend weighing the cars in the night before your event. At the very least, ask participants to try to arrive early for weigh in. You are more likely to start your event on time if you do not have to wait for participants to adjust the weights on their cars. It's also a good idea to have a gathering activity for participants to do once their cars have been weighed. Decorations, awards, and refreshments are as important as the race itself. 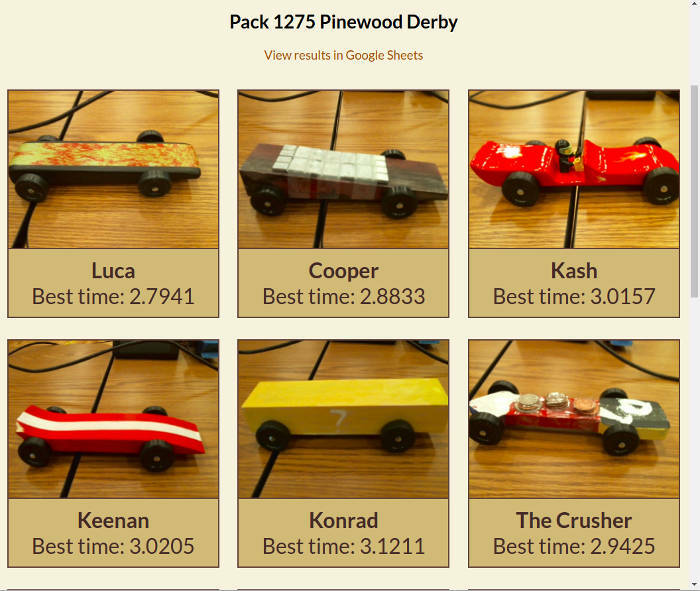 The pinewood derby is much more than just another pack meeting. Make this event special. About 45 minutes before the event begins, we will set up our track and timing system at your facility. We may ask you for help carrying in the track, which is heavy. You will need to provide tables and chairs. The images below are two recommended room layouts. The track requires an open area of at least 15' x 40'. Traffic cones (provided by us) are used to form a perimeter around the track. You should have a table designated for participants to place their cars before and during the race. You may want to set each car on a paper plate so it doesn't roll off. You may also want another table for making adjustments or adding graphite. You will want to cover these tables with a disposable table cloth so that graphite from the cars does not stain the table. You may also want to have additional tables for refreshments and awards. We will also need a table (at least 5 feet long) for our equipment. If your facility has a projector screen, we would appreciate using that as well. We also recommend using a microphone before, during, and after the race. The emcee typically stands at the head of the track near the projector screen. As participants arrive, they should make adjustments to weight and verify their car will roll freely on the track. An adult volunteer should verify that all cars are 5 ounces or less. If you have more than about 20 cars, it is a good idea to hold a separate weigh-in before the event. Once the participants have arrived and their cars have been weighed, you can hold your opening ceremony. You can award your regular Cub Scout awards at this time, but avoid taking too much time doing so. After this, we will begin check-in. We will ask the participants to line up behind our laptop with their cars. We will ask each participant for their name and photograph the car. If you plan to group first, second, and third place awards by den or age group, please let us know before check-in. After each car is checked in, participants should take their cars back to the designated table. You do not need to assign numbers to the cars or provide us with a list of participants' names. Check-in usually takes less than 10 minutes. After all cars have been checked in, we will give a few instructions to the participants before beginning the race. Lane assignments are generated automatically. During the event, the four cars that are up to race will be shown on the projector screen. The next four cars ("on deck") are also shown. As each race concludes, the participants should retrieve their cars and take them back to the designated table. 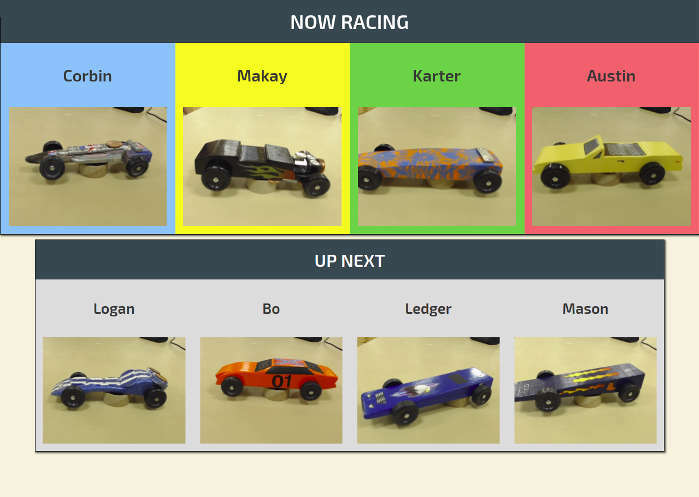 In our standard race format, each car races at least once on each of the four lanes, and sometimes more if time allows. For 20 participants, this takes about 20 minutes. If you plan on assigning special awards to the cars, such as "Judges Choice" or "Best in Show", we recommend doing so during the race so the participants and their families do not have to wait. You can find pictures of all the cars and who they belong to on our live results page once the race begins. 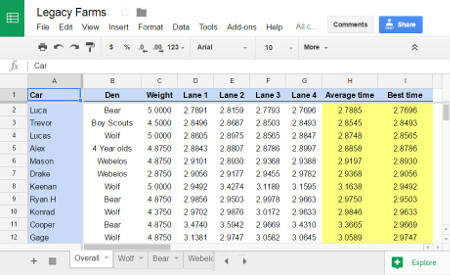 After all the races are complete, the results will be available as a Google Spreadsheet on your mobile device or computer. You can access the results from our home page. The cars are ranked based on their best time from all four lanes. You can view overall rankings as well as rankings grouped by den or age-group. You should conclude your event with an awards ceremony. In addition to first, second, and third prize, it is good to recognize and award something to every participant. We do not provide awards or trophies. After the closing ceremony, we will leave our track set up for a few minutes to allow for some races just for fun. This is a great time to invite siblings and others to race. Do you have any tips for building a fast pinewood derby car? We share a few tips on our Information for Participants page. Can siblings build cars and race them? Yes! After the closing ceremony we will leave the track up for a few minutes to allow races just for fun. How long do you need to set up? Take down? We usually arrive 45 minutes before the opening ceremony to allow time to set up our track. Take-down typically takes between 20 and 30 minutes. 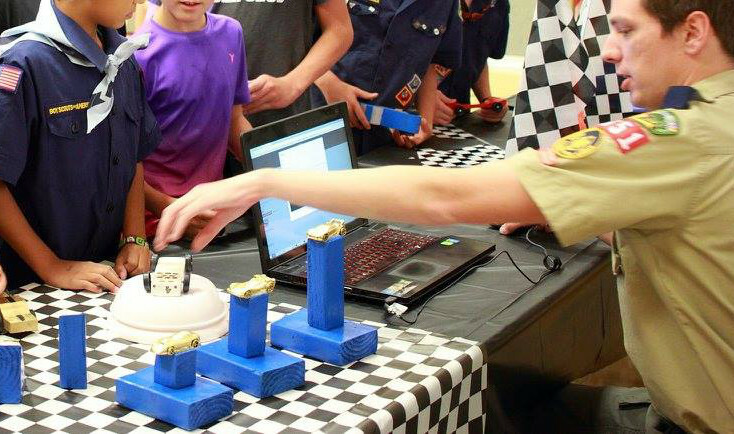 How long does a typical pinewood derby last? 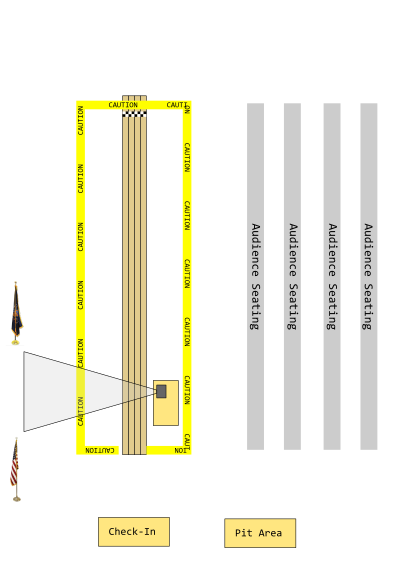 An entire pinewood derby program, from opening to closing cermony, typically lasts just under an hour (add one or two minutes for each car over 20). Who emcees during the event? You will emcee during the opening ceremony, awards ceremony, and closing ceremony. We typically emcee the race itself, although some pack leaders that are enthusiastic enough have done an excellent job. Are there any rules we need to know regarding the track? We ask that you not allow the boys to run near the track. There are ropes, cords, and other objects that could present tripping hazards. During setup and take-down, the rope barrier that normally surrounds the track might not be up. Please refrain from stepping over the track in this case. We also ask that you put away basketballs and any other things that could damage the fragile components of the track. Do you need any help setting up the track or taking it down? We do appreciate help taking equipment, some of which is very heavy, to and from the car. Do we need to provide a list of names or give numbers to each car? No. When each participant checks in, we take down his name and photograph his car. The names and pictures of the cars are shown on the projector screen during the race, so that the participants know when it is their turn to race. How many times does each participant get to race down the track? Each car will race four times during the official race. We sometimes give each participant one or two bonus races if time allows. After your awards ceremony and closing ceremony, we will leave the track up for a few minutes to allow races just for fun. Cars are ranked according to their fastest absolute time. For fairness, each car will race at least once on each lane. If you want to rank cars by den or age group as well as overall, please let us know before check-in. How do I assign special awards? Most pack leaders bring a stack of blank certificates which they fill out during the race. You can either decide on your award categories ahead of time or make them up on the spot. If you are not sure which car belongs to which participant, we will have a list of cars and first names on our website which you can access on a mobile device. How is the race order determined? In the first heat, cars race in the order they were checked-in. In subsequent heats, our software groups similarly performing cars together, resulting in closer finishes and better chances that any given car will win at least one race. Almost always, the final race is between the top four fastest cars, meaning that the derby remains undecided until the last race. How and when do we see the results? Results are displayed immediately. On the projector screen we show the results of the previous race, and the current best times of the 12 fastest cars. You can also see live results on our homepage. Click through to your event, and follow the links to see the results on a Google spreadsheet. If results are shown immediately, doesn't that take some of the suspense and surprise out of the awards ceremony? Yes, and that's just the way it is. Think of the derby as an Olympic event. In the Olympics, the results are usually known as soon as a race is concluded. This is why commentators build suspense before the event, saying how fast so-and-so needs to go to win a medal, and so forth. In our derbies, the four fastest cars race together in the final race. We will build up the suspense and tension just before the final race, and when the cars cross the finish line, everyone will know who the winner is. During the awards ceremony, you can still surprise the participants with special awards. Are your events limited to just Cub Scouts? No. We can also run events for activity days girls, youth or adult groups, family reunions, work parties, etc. Do you allow "anything goes" races, without rules? We do, but not at the expense of the safety of the participants and the track. Also, we do not recommend relaxing any of the rules for Cub Scouts. Please contact us with specific questions. Can I rent the track and run the event myself? We accept cash, check, and PayPal (online credit card). When is payment due? Do you require a deposit? Payment is due on the day of the event. No deposit is required. We will send an invoice via email about two weeks before your event. Try to give us at least 24 hours notice before cancelling. Do you run events outside Utah County? Yes, but a travel charge may apply. What timing system and software do you use? The track, timing system, and software are 100% homemade. The track is constructed from hand-selected plywood. The timing system is powered by an Arduino and uses a contact switch to detect the release of the starting gate. The finish line uses four infrared breakbeam sensors to record when the cars cross the finish line. The software to manage the race and collect results was written in Node.js and Angular. Sure. You can find us on Facebook.